Grease or spray 12-cup Bundt® cake pan. Mix granulated sugar and cinnamon in 1-gallon bag. Separate dough into 10 biscuits; cut each in quarters. Shake quarters in bag to coat; place in pan. Mix butter and brown sugar; pour over biscuit pieces. Bake at 350°F for 40 to 45 minutes or until golden brown. Cool 5 minutes. Turn upside down; Top with crispy bacon bits and caramel sauce, pull apart to serve. Serve warm. 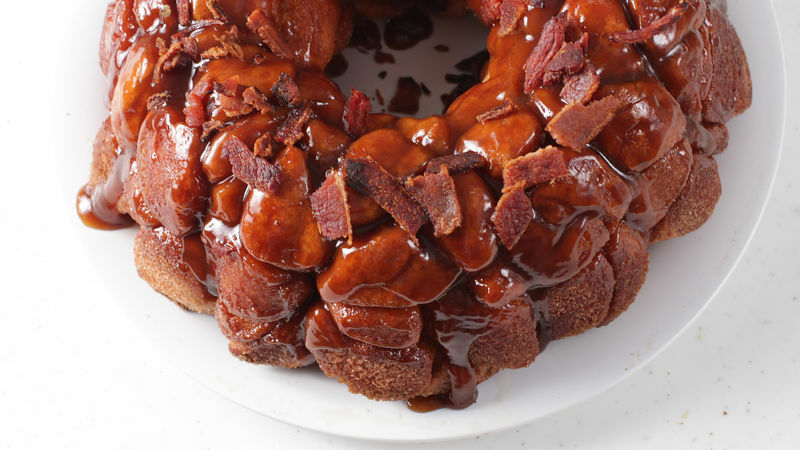 Caramel Bacon Monkey Bread? BREAKFAST. IS. SERVED. Look at the bacon. Look at the caramel. Look at the carbs. I’m pretty sure this is a complete meal. Growing up, we always had monkey bread for random weekend breakfasts. I’m pretty happy with this whole setup of taking a classic and updating it with some salted caramel sauce and crispy bacon bits. First up: Ingredients!! Some cans of Pillsbury Biscuits, brown sugar, melted butter, cinnamon sugar, and the bacon and salted caramel topping. First, open the biscuits and cut them into quarters. Secret shortcut: lay out the biscuits into a grid and use a pizza cutter to make your cuts. Someone (‘twas I) couldn’t find the pizza cutter to show you, but it helps! Those cut up biscuits get tossed into a gallon Ziploc bag and shaken up with the cinnamon sugar, then they go into greased bundt pan. Top that with the melted butter and brown sugar and bake. That business gets turned out onto a plate and topped with bacon bits and salted caramel. P.S. Sorry about my claw hand, I just had to show that sticky caramel business! ALL ABOARD THE SWEET AND SAVORY TRAIN.